Turkey’s Foreign Minister announced a bold plan Monday to boost trade with Cambodia by more than 400 percent over the next five years, aiming to reach $500 million in bilateral trade by 2020, up from about $124 million last year. The majority of Cambodia’s financial institutions on Monday signed a nonbinding code of conduct that aims to increase customers’ awareness of their rights at a ceremony at Phnom Penh’s Intercontinental Hotel. The Phnom Penh Water Supply Authority (PPWSA) will lose more than $200,000 a year due to a new policy designed to lower water rates for workers and students living in rented rooms, the authority’s director said on Thursday at a meeting with hundreds of landlords at Wat Chumpou Voan in Pur Senchey district. 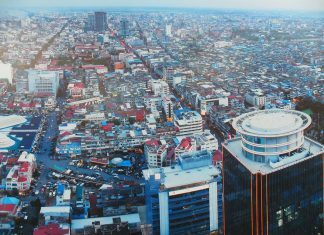 Revenue in the country’s insurance sector increased 26.7 percent in 2014 compared to the previous year, generating $53 million in total income, according to a report released on Wednesday by the Insurance Association of Cambodia. A CPP-aligned youth group and a regional road-safety NGO on Tuesday launched a $1.2 million, two-year pilot program to educate Cambodians about the importance of wearing helmets while driving or riding as passengers on motorbikes. Two weeks after Prime Minister Hun Sen announced a government initiative to slash the price workers pay for electricity by preventing landlords from overcharging tenants, state-run Electricite du Cambodge (EdC) began the process of fitting rented rooms with its own meters Thursday. The head of the country’s largest teachers’ association sent an open letter to Education Minister Hang Chuon Naron on Wednesday contending that there is a serious shortage of textbooks and teacher manuals due to corruption and indifference on the part of ministry officials.